Here is the strawberry pretzel dessert I mentioned yesterday. I followed a recipe from Allrecipes.com, but I changed the proportions a little. 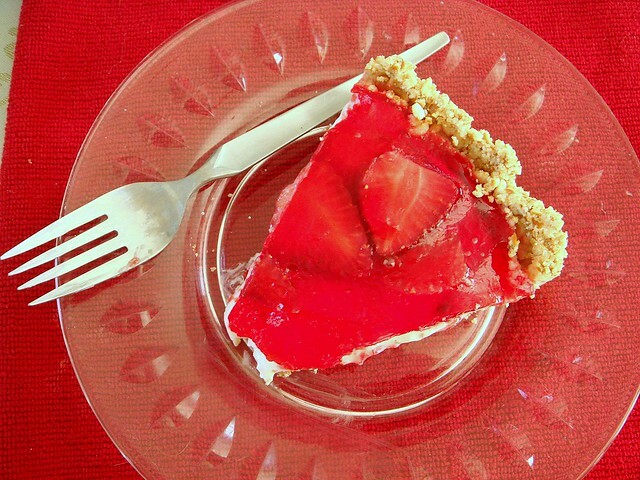 We usually make either a coconut cake or fruit-based dessert for Easter, with a key lime pie being the norm. I wanted to make a new dessert this time, albeit not one we haven't tried before (it's good practice never to attempt a new recipe for a holiday or event -- I've learned that lesson). It's still fruity, though this dessert has more textures and flavors. Such as the pretzel crust. It's comparable to a graham cracker crust in method, only I think it tastes much better and gives a salty-sweet element to the dessert that I really enjoy. It comes together by grinding pretzels in a food processor. 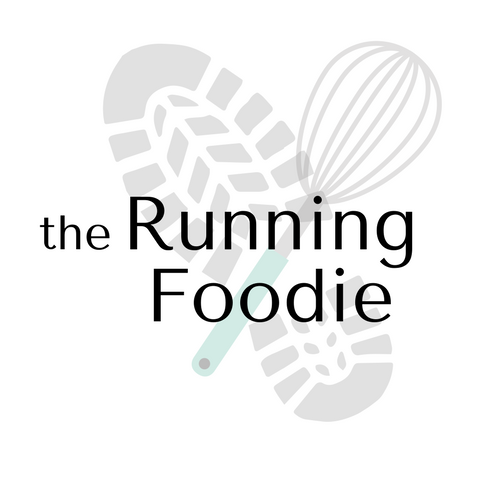 The pretzels don't have to be ground entirely to a floury consistency, but you want it to be finely ground enough so that it can form a crust that can be sliced without falling apart. After the pretzels are ground, they're mixed with sugar and melted butter. Many versions use a 13x9-inch baking dish. I wanted a more elegant presentation, so I used a springform pan, pressing the pretzel crust up the sides just like a tart. The bottom layer consists of sugar, softened cream cheese, and cool whip. 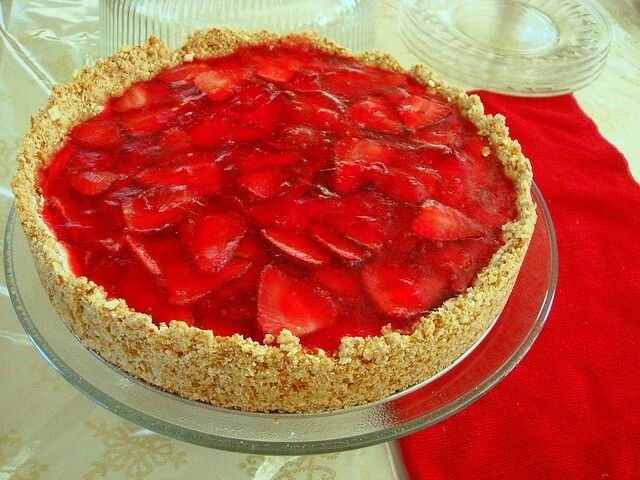 It's sort of a light, airy cheesecake layer and a pleasant contrast to the salty pretzel crust and strawberry jello layer. It's important to chill this layer before pouring the jello on top, otherwise the red jello will seep into and stain the cream cheese. Finally, the strawberry jello layer! Unlike the cream cheese layer, which I cut in half, I doubled the amount of jello but used less liquid called for in the original recipe. I did this for flavor and so that the jello layer wouldn't be too soft. Instead of using frozen recipes, I sliced a 16-ounce container of fresh strawberries, sprinkled them with 3-4 tablespoons of sugar, and let them stand for an hour or two while the jello partially set. This helps draw out the flavor of the strawberries, which is especially important if the strawberries are tart. It also adds more flavor to the finished dessert. I read in a few recipes that the strawberries fell to the bottom when mixed immediately into the hot jello mixture, so I let the jello chill enough so that had a chance to partially set before adding the strawberries and any accumulated juice. 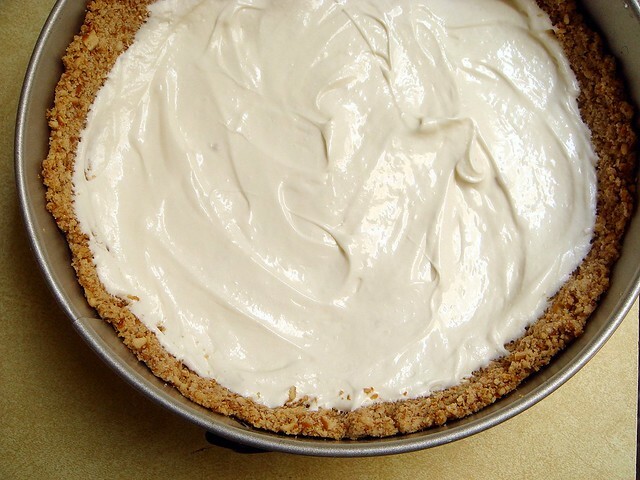 Since it is partially set, it's easier to pour onto the chilled cream cheese layer and the liquid won't seep into the cream cheese and crust. The dessert was a success and tasted really refreshing. I had some trouble slicing the layers because the strawberry slices wouldn't cut, causing the jello to slide over the cream cheese. Next time, I might finely dice the strawberries, though I think it looks prettier with slices. Preheat oven to 350°. Combine the crushed pretzels with the sugar and butter. Press mixture on the bottom and about 1 - 1 1/2 inches up the sides of a 9-inch springform pan. 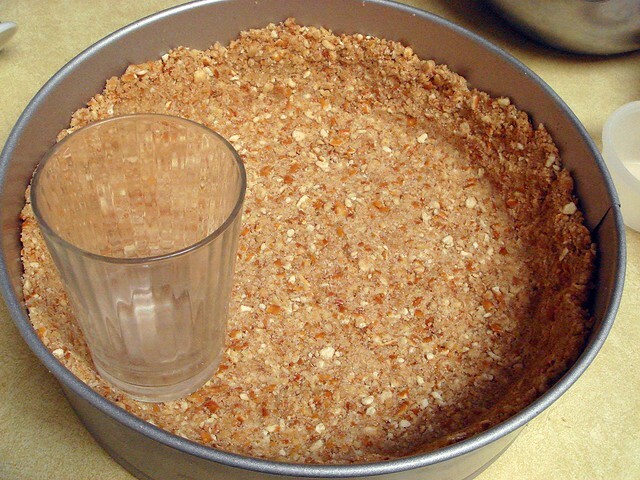 A small glass can help press the crust into the creases and sides, if needed. Bake for 10 minutes; remove from oven and let cool completely. In a medium bowl, beat cream cheese with sugar until combined. Beat in lemon juice or extract. 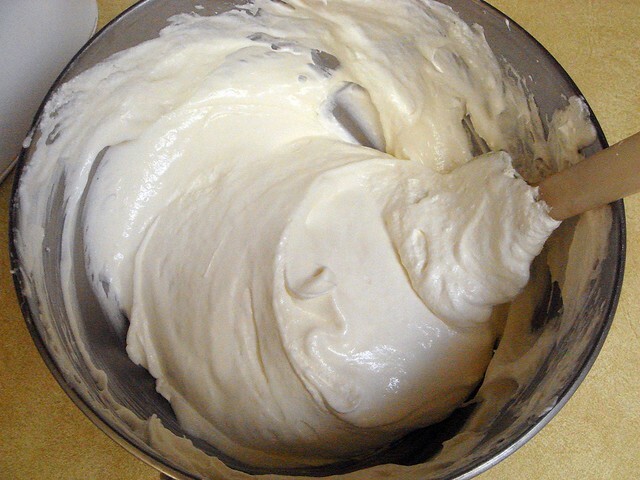 Stir in one third of the cool whip to lighten the mixture, then carefully fold in the remaining cool whip. Pour into the prepared crust. Refrigerate while you prepare the strawberries and jello. Hull and slice the package of strawberries. Place in a bowl and toss with sugar. 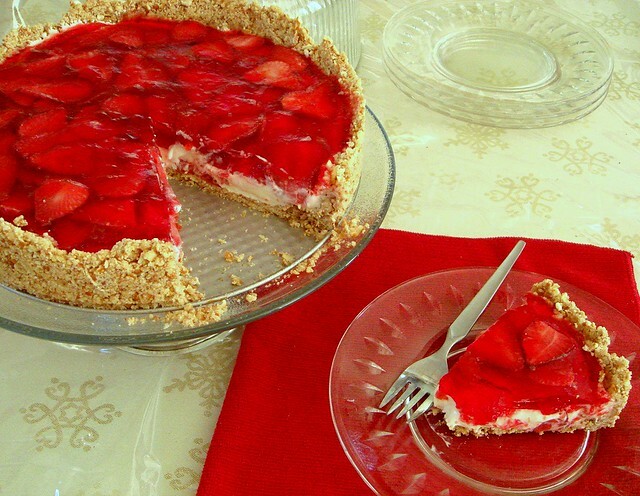 If the strawberries are very tart, use the full amount. Pour the contents of the jello packets into a heat-proof plastic container; stir in the boiling water until powder is dissolved. Refrigerate until mixture has cooled and is partially set. 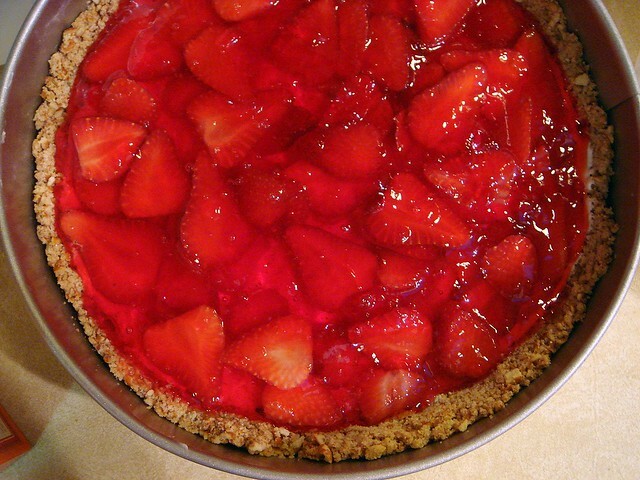 When jello is of proper consistency, stir in the sliced strawberries and any accumulated juice. Pour on top of cream cheese layer, smoothing the top if necessary. Refrigerate overnight. To cleanly slice, dip a serrated knife into hot water and wipe off with a paper towel. Repeat process before each new slice. looks amazing! i've had this dessert before, but when i made it the strawberries did sink to the bottom. so next time i'll have to use your tips! I like this a lot. Strawberries and pretzels. Like. Think of all the fruity pretzle desserts you can make now. Funky banana pretzel dessert? Yes please. The Harried Cook, the crust was my favorite part of this dessert. Sarah, glad I could help! Emily, mmmm, bananas. Or mango, for a tropical twist! Well, bananas are tropical, too.